As a nurse, you are all too familiar with heavy lifting, sustained awkward positioning, excessive reaching, and static posturing. With this comprehensive volume, Nelson, Motacki, and Menzel show you that there is another way. Learn about the new techniques and technologies specifically designed to reduce caregiver and patient injuries. 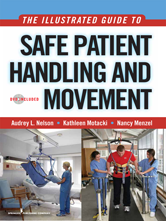 The authors present the Evidence-Based Safe Patient Handling Program, a practical system of guidelines to be used in numerous clinical settings. Each chapter explains how to apply the program to specific clinical settings, such as medical and surgical, critical care, orthopaedics, pediatrics, labor and delivery, rehabilitation settings, the perioperative suite, and nursing homes.